Now available from ECI is the TM1200, a 1.2T blade (dual 600G channel) that allows for a programmable, adaptive optical network. Blown fibre and ducted network solutions provider, Emtelle has revealed a new 24-fibre bundle solution at Broadband World Forum 2018 in Berlin. NetComm has expanded its Distribution Point Unit (DPU) portfolio, adding new form factors in order to allow for a wider range of deployment models. ATX Networks has launched GigaWave, a next-generation digital optical gateway platform that is designed to allow cable operators to expand the capacity of fibre access links between head ends/hubs and outside plant facilities in a ‘pay-as-you-grow’ model. 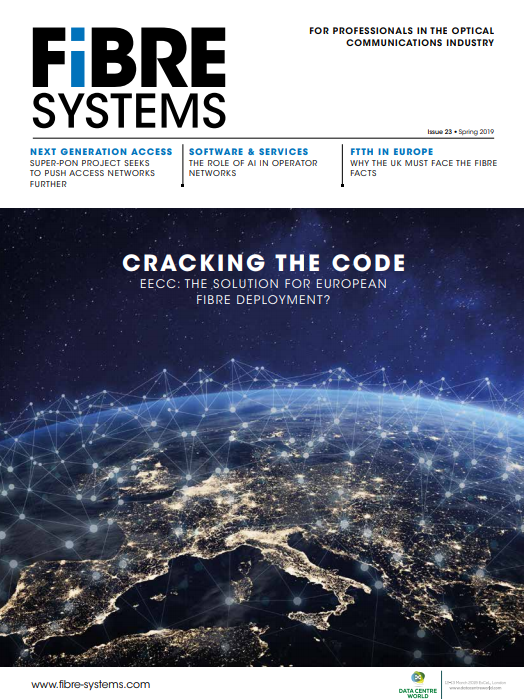 Emtelle has added FS:Detect to its product range in order to provide an integrated kit designed to pinpoint damage and deliver error-free microduct selection in fibre networks. Developed by New Zealand-based FiComms, the FiSpy kit – which was showcased for the first time at this year’s ANGA COM conference and exhibition in Cologne – consists of two complementary hand tools. Panduit has made available its new Net-Verse Cabinets with a flexible design for applications that require scalability, security and cost efficiency in on premises and colocation/cloud data centre or enterprise deployments. Complimenting the company’s line of configurable and energy efficient Net-Access Cabinets and featuring front and rear doors with a generous 69 per cent opening for optimised airflow, the Net-Verse is designed for applications that require optimal thermal management within the latest containment environments. AFL has launched the LightLink 550 optical splicing and distribution enclosure (LL-550), a compact wall-mounted enclosure that builds upon the success of its larger counterpart, the LightLink 580, by providing similar patching and splicing capability but in a smaller form factor. The LL-550 is useful for business service hand-offs, MDU distribution and connectivity, cellular backhaul and other commercial services that require weather-proof field connectivity, but may have size constraints due to crowded cabinets, telco closets or other congested mounting surfaces. Adolite launched and demonstrated at OFC 2018, its new technology to help providers keep up with accelerating data growth. The company’s patent-pending process replaces embedded fibre with polymer, which it says will deliver sophisticated, high-performance optical transceivers, active optical cable (AOC) and on-board optics (OBO) — at 100G, 400G and beyond.